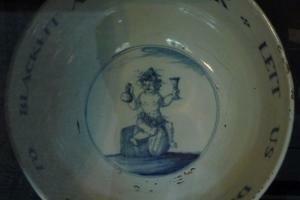 18th century ceramic toasting bowl, Wallington House, Northumberland. 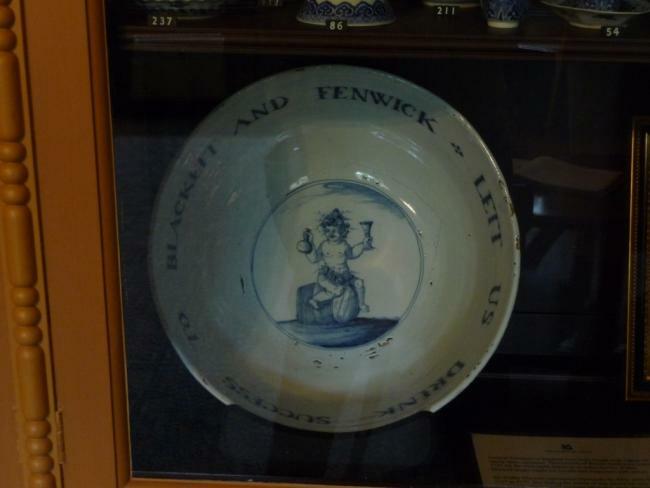 One of a pair of bowls preserved at Wallington House, matching in design but not in size, which clearly relate to an election campaign. The motto reads: ‘Lett us drink success to Blackett and Fenwick’. The Wallington guidebook suggests that this refers to the 1741 Newcastle election, which saw the return of Walter Calverley Blackett and Nicholas Fenwick. However the same pairing was successful in 1734, and Fenwick was also elected in 1727 with Sir William Blackett. FENWICK, Nicholas (c.1693-1752), of Pilgrim St., Newcastle-upon-Tyne, and Lemington, Northumb.